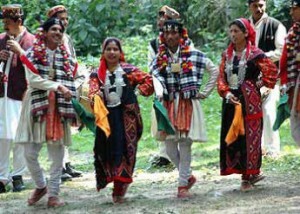 In Himachal Pradesh a variety of Naati dances are performed. There are about 13 different kinds of Naati. For special occasions three kinds of Naati dances are performed which are known as Dhili, Pheti and Bashari. Both men and women participate in the dance. The Naati dancers wear typical costumes. The female dancers weal Thipu, a square red scarf tied over the head; Kurti, a kind of colorful upper garment usually made of velvet; Pattu, the main upper garment beautifully embroidered; Sutban, a trouser – like garment usually made of colorfully printed cloth; Puhla, shoes made of a kind of fibre. They also wear typical jewellery, such as Gorkhadu, the ear ornament made of gold; Long, a top for the nose; Chandarhaar, a long and heavy necklace made of silver; and Kanganu or Mridri, bangles made of solid silver. The costume for the male dancers consists of Topa Kalagi, a woolen cap with one side rolled up; Balay, big earrings made of solid gold; Chopla, white woolen upper garment; Patka; a scarf, one tied around trie waist and another across the shoulder; Pajamas, white trouser-like garment and Pula, the shoes. The orchestra that accompanies the dance consists of Dhol, the drum with two faces, Nakara, a bowl shaped drum with one face; Shehnai, the wind instrument; Narshingha, an S-shaped trumpet; and Karnal, the straight trumpet.